I'm a bookaholic and lately I've been on a buying binge. I love finding treasures, especially craft books, - click the library list on the right side and you can see some of my books - and I've lucked into some great stuff on Ravelry, Amazon, Amazon Marketplace and AbeBooks. 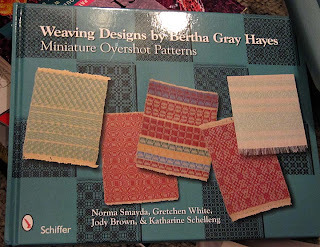 My favorite find (this week, anyway): Weaving Designs by Bertha Gray Hayes. Bertha developed these miniature overshot patterns - over 100 original designs - about a century ago and the Rhode Island Handweavers Guild published this oversized compilation last month, with color photos of each design. I've been wanting to try my hand at overshot. Most of the patterns are for a 4-harness loom, which means that, in theory, I could weave these. Maybe this could be my summer project? 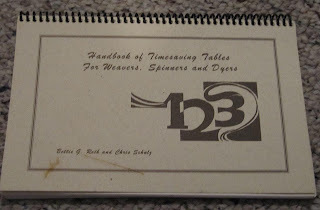 I bought these next two from a fellow Raveler - a self-published copy of 'Handbook of Timesaving Tables For Weavers, Spinners and Dyers' and 'How To Make Braided Rugs', published in 1977. 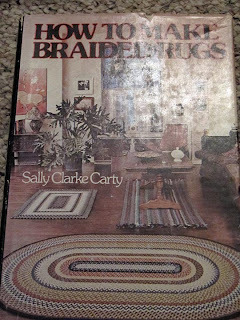 I've never made a braided rug, and I probably never will, but if I ever get the urge some night at 3 a.m., by golly, I'm prepared! This next one is Gigi's fault. 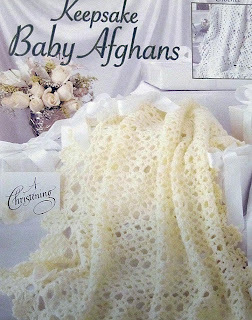 I loved her baby blanket (go look; it's worth it) and thought it would make a beautiful shawl. I'd seen this book before and passed on buying it; the photos inside just don't do justice to the pretty patterns. I had to chase it down on the Internet - now that I want it, it's hard to find. Of course. Now I need to find that alpaca I was saving for something special.